Photo of the Dec. 20, 2010 total lunar eclipse from Cochranville, Pa. taken by Kevin R. Witman, using a Meade LX50 10" Schmidt Cassegrain telescope and a Canon XS DSLR camera. A blood-red moon hung in the black sky on the darkest night of the year last night (Dec. 20). The total lunar eclipse was the only one this year and the only one in the last 372 years to coincide with the winter solstice in the Northern Hemisphere, which is the longest and darkest night of the year. Skywatchers around the country got some gorgeous views of the moon, as long as it wasn't obscured by clouds. Westlake also managed to snap a picture of the moon with star constellations behind it. 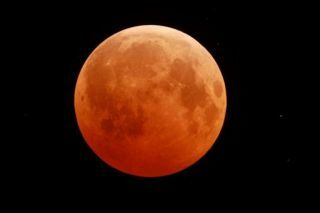 "The totally eclipsed moon was positioned at the feet of the Gemini Twins and near the M35 star cluster," he told SPACE.com. "The perfect Christmas Gift from Mother Nature!!!!!" Kevin R. Witman of Cochranville, Pa. wrote on SpaceWeather.com. "Definitely a lighter eclipse compared to past years." Witman captured two photos of an amber, bronze and orange moon. David and Jaime Campbell of Lawrenceville, N.J., and Michael Vagnetti of Brooklyn, N.Y. both wrote to SPACE.com to say they estimated last night's eclipse to be an L=2 on the scale, corresponding to a deep red or rust-colored eclipse. Robert Lane, viewing from Windermere, Fla., concurred. "I had an excellent view of the eclipse with pretty good darkness conditions," he wrote in an e-mail. "At 0317 Eastern time, I observed probably 95 percent of disk to be dark red in color with a slightly lighter ring as the perimeter."